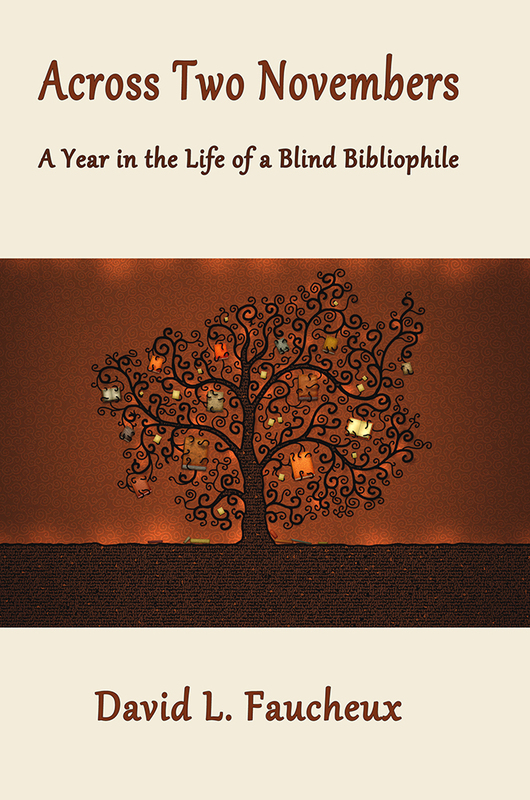 Writer David L. Faucheux is here with me to chat about his memoir, Across Two Novembers: A Year in the Life of a Blind Bibliophile. During his virtual book tour, David will be awarding a library edition audio book (US only) to a lucky randomly drawn winner, or if an international winner, a $15 Amazon or Barnes and Noble gift card (winner’s choice). To be entered for a chance to win, use the form below. To increase your chances of winning, feel free to visit his other tour stops and enter there, too! Welcome, David. Please tell us a little bit about yourself. I’m pleased to take a moment to talk about myself and what makes me tick. I’d have to say books, books, and more books. Let me explain. Braille and recorded books take me places and show me things I would otherwise never get to encounter. They see for me by their descriptions, their vivid word pictures, and lyrical prose. They befriend me when I'm lonely, educate me when I'm curious, and amuse me when I'm in a blue mood. I have always known I could pick up a book and for a time be in a better or at least A different place. Books don't judge, ignore, or marginalize us. I remember long, hot, Louisiana summers that were perfect for curling up with a good book. I have had to struggle some nights to put the book away because I’d not be able to get up for work the next morning. That’s being a bit too biblioholic. I have worked as a medical transcriptionist and braille instructor. I attended library school in the late 1990s when the Internet was starting to take off. I ran an audio blog for several years. I have also served on the board of a nonprofit organization that attempted to start a radio reading service in the town where I live. Since 2006, I have reviewed audio books for Library Journal. This bit is from the CreateSpace blurb. I think it sums things up rather nicely. I wanted to be heard; I have long felt invisible. I was at a place in my life where several career options simply collapsed. I had no idea what to do next. A friend asked me to review something she had written. I did and thought, ‘I think I could write a journal.’ So I dove in and did. More than at any other time, when I hold a beloved book in my hand, my limitations fall from me, my spirit is free. As someone who is acquainted with Dr. Schneider (we have exchanged emails), I could wish I occupied my 40s quite as well as she does her 60s. The proactive attempts to educate about disability issues, the volunteering, and the public speaking are outstanding. Maybe some of her enthusiasm for life will rub off on all her readers.—An excellent vade mecum, a handbook, for handling the uncertainties of retirement. So, everyone, here goes nothing! I am in an in-between time. I am trying to promote this book and figure out where my writing career wants to take me. Will I write a nonfiction book about an ancestor? Will I try to write a short story collection? I’m not sure I consider myself a writer. I concede that I may have writing ability. I don’t feel compelled to write. I more feel compelled to read. But I thought I should try to write, too; just a bit. Oh, as a child, I did rather like the idea of being this exotic creature known as “a writer.” But I had no idea w hat such a career involved. I try to write several hours a day. I can’t write more than that because of the Fibromyalgia Syndrome that nips at my heels like a stray dog that just won’t go home. If I try to write longer, I get so befuddled. This caused some problems in the editing of my book. I kept finding better ways to say things and it drove my long-suffering editor crazy. I am hung-up on grammar. I need to just fling the words onto the page, or type them into a computer file and not worry about any punctuation or spelling -- Just plop a word-mess right there, no grammar or style litter boxes. Like Jackson Pollock painted! Drip … splat … splot. The novel as abstract expressionistic art. This is a hard one. Being blind, I had no real role models. I had no idea what to be. Even in college, I had no idea what to major in. I tried Spanish as I thought being an interpreter would be rather fun. I didn’t have the knack for this language, having only had a year or so in high school. I never got past its rapid staccato sound. So I changed my major to English (linguistics option) with a Spanish minor. A very unsympathetic professor destroyed my interest in pursuing linguistics at the graduate level. I literally came to a screeching halt after college. It was not a good time. I managed to get a job teaching braille for a time and also did medical transcription for a time, but neither worked out well. Yes, and I appreciate this opportunity and your thoughtfulness. I’d like to answer the question – If you had the talent and resources to research and write any kind of book, what would you write or if you – as an editor – could commission any kind of book, what would it be? I have several ideas for books though I suspect the fiction options are beyond my skills and would have to be commissioned. I suspect long historic fiction is out of favor with the reading public of today. Alas. 1. Empress Eugenie: She was just as interesting as Empress Elizabeth of Hapsburg or Queen Victoria, two of her contemporaries. But I find no writer today, writer in English, who has done anything with her, be it a fictionalized biography, or even a straight memoir or biography. If French writers have written about her, I have not located the translations. She has not been written about for the young adult set though there is a series of books for younger readers that feature a young Queen Elizabeth I and other young royals, some written by Carolyn Meyer. Eugenie lived at a particularly interesting time and reigned over the circus that was the empire of the third Napoleon. It all came tumbling down in 1871 and she later lost her son in a hunting accident in South Africa. She lived until 1920. Surely, if Marie Antoinette rates, Eugenie should. Margaret George could have written the story. She did Henry VIII, Mary Queen of Scotts, Queen Elizabeth I, Helen of Troy, Cleopatra, and Nero. If I could, I would have. 2. Inca: Gary Jennings wrote Aztec. (Actually, there were several follow-up books to his Aztec, but it was Aztec that was outstanding, the others were possibly written at the suggestion of an editor to hopefully cash in on Aztec’s success. I always hoped he would have lived long enough to write Inca to do for that group of South American natives what Aztec did for Mexico. 3. Short story collection about my days at a residential school for the blind: I could possibly do this with some guidance. This type of school is rapidly fading from popularity. Most blind children today are mainstreamed into public schools. In the 1970s, this was not always true. 4. Isabella Mora: She is an ancestor of mine. She came here to Louisiana in 1779, about age 10, with her Canary Island family. I found her story interesting because two of her descendants married and we think caused the eye condition in our family. Also, exploring her life in Spanish Louisiana would be interesting because few people recall Louisiana was Spanish for a time, not just French. 5. Wahl Diet: I’d like to go to a diet boot camp and attempt this diet. The author, a Dr. Wahl, developed it and it cured her MS or made it more manageable. But it’s a very hard diet, kinda like paleo. I’d be curious to see if it might help my Fibromyalgia Syndrome. I think it’d be a neat book or at least major article. I’d want to put it to the test. Takes money to go to see any doctor like that. 6. MFA in Gastronomy: Books have been written about the author’s time at business school, Snapshots from Hell, or in law school, One L: The Turbulent True Story … And now we need a book describing a class beginning its time at Boston University to obtain an MFA in Gastronomy. Seems such a unique degree, rather new, developed by Julia Child and Jacques Pépin. Well, enough said. I am running on. So many ideas to work with! Thank you for being a guest on my blog, David! Thanks for visiting today. I hope you find the book bit given above to be of interest. Check out http://www.dldbooks.com/davidfaucheux/ to learn more. Be careful if you read the book as you might find yourself curious about other books mentioned and want to read them. I have a question: If you could visit the world described in any book, which would it be? Check back later for my answer. I’m ready to answer the question I asked earlier today. If you could visit the world described in any book, which would it be? That is a hard question for me. Do I want an historically accurate world such as that of a 19th-century circus depicted in Gary Jennings’s Spangle? Do I want a fantasy world such as that in any of the David and Leigh Eddings books? Would I like an alternate history world such as that depicted in the Two Georges by Richard Dreyfus and Harry Turtledove? Or perhaps, a science fictional world such as that depicted in Ben Bova’s Titan? Well, I could choose so many worlds. I suspect one world that might interest me is the America depicted in John Jakes’s novel Homeland. The novel is set in the late 19th-century and tells the story of Paul Crown who has come to Chicago. There is a section of the novel, my favorite part, that is set at the famous 1893 World’s Fair which took place in Chicago. You get a sense of wonder and possibility. The world had not yet had either world war. Science was beginning to change how people lived. Electricity, the marvel of the age, lit up the White City as if by magic. A teenaged Helen Keller visited with her teacher and companion. Paul Crown’s story is continued in American Dreams. I have no idea when the last in the trilogy will appear. These long novels can take time.